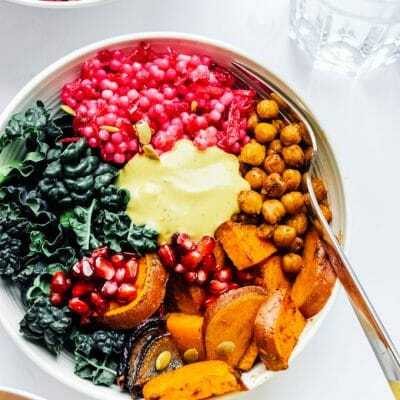 For a vibrant yet easy vegan dinner, these Roasted Vegetable Buddha Bowls do the trick, packed with colorfully delicious flavors and drizzled with creamy, protein-packed Yum Sauce! Yum Sauce: Blend together yum sauce real quick (recipe here). Sweet Potatoes: Preheat oven to 400 degrees F (204 C). Toss chopped sweet potato with all Sweet Potato ingredients to evenly coat. Arrange in a single layer on half of a parchment paper-lined baking sheet. Chickpeas: Pat chickpeas dry with paper towels then toss with all Roasted Chickpea ingredients. Spread onto the other half of the baking sheet. Bake for 20 to 25 minutes, or until sweet potatoes are soft and chickpeas are a bit crisp. Couscous: Meanwhile, bring water to a boil in a medium saucepan. Add couscous, reduce heat to a simmer, and cook for 10 minutes, or until tender. When finished, fluff with a fork then stir in remaining Beet Couscous ingredients. Assemble: Add a handful of kale to each bowl, evenly dividing roasted veggies and couscous on top of each. Top off with a healthy heap of Yum Sauce. Recipe from Live Eat Learn at https://www.liveeatlearn.com/roasted-vegetable-buddha-bowls/.